In a recent platform update, Adventive introduced Creative Groups. 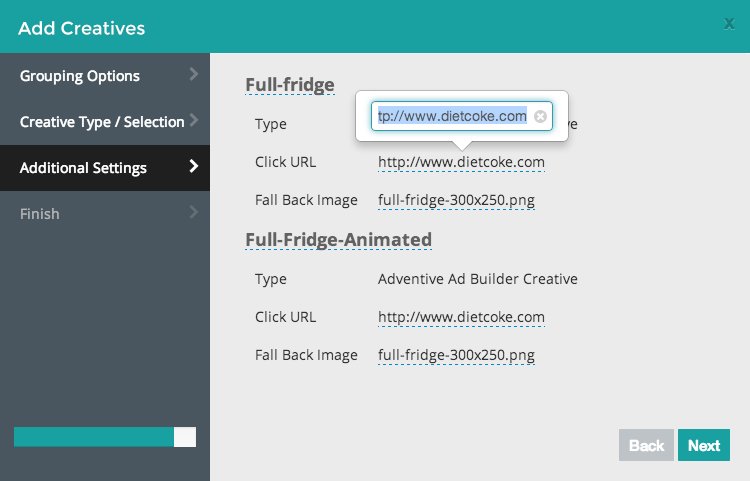 Creative Groups allow the ability to traffic multiple creatives with a single tag. Creative groups also enable real-time optimization–allowing you to add, remove, replace or pause individual placements without disruptions to live campaigns. Easy A/B and multivariate testing, seamless creative rotation and in-flight updates improve, not only operational efficiency, but overall campaign ROI. 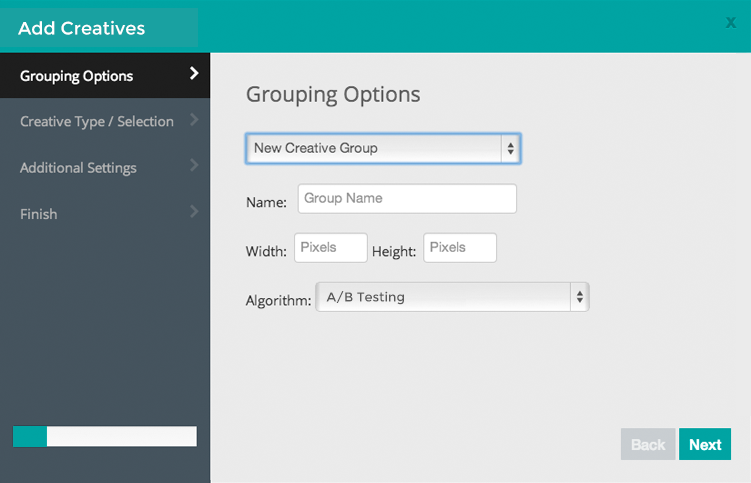 Step 1 Give your group a name, specify ad unit size then select an optimization algorithm. 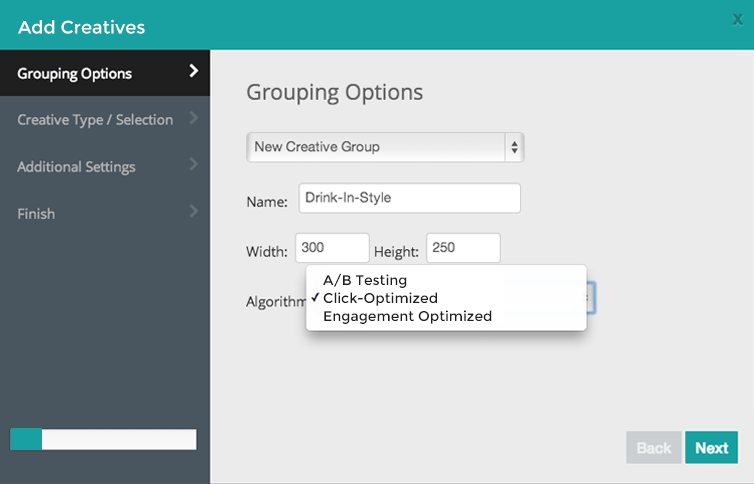 Adventive's optimization algorithms allow you to determine which offers, creatives and messages engage audiences by optimizing creative groups according to predefined criteria. No coding or setup required. Just select an optimization algorithm and Adventive will automatically deliver the best performing ad. Optimization Methods Manual: A/B Testing A/B testing (sometimes called split testing) automatically distributes impressions equally between all creatives within the group. You can then manually pause or remove poorly performing creatives from your campaign. Automated: Click-Optimized Creatives will be optimized according to click-through rate (CTR = Click-throughs/Impressions) . Creatives with the highest click-through rate will be served more often. Adventive will automatically phase out poorly performing creatives. Automated: Engagement-Optimized Creatives will be optimized according to engagement rate (ER = Total Engagements/Total Impressions). Creatives with the highest engagement rate will be served more often. Adventive will automatically phase out poorly performing creatives. Step 2 The next step is to select your creative. 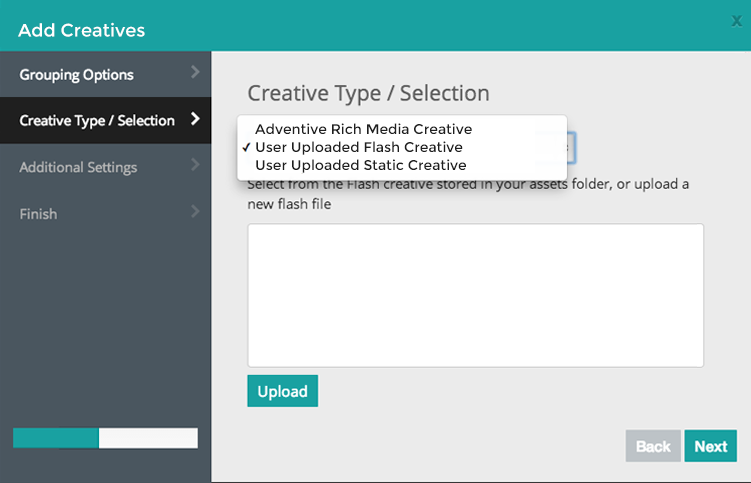 You can choose rich or static ads you've built with Adventive's Ad Builder or upload external Flash or Static creative. Step 3 If you haven't already done so, set your default click-through URL and select a fall back image. You're now ready to traffic. Looks easy right? At Adventive, our mission is to make digital display fast and easy without sacrificing creative control. Get in touch if you have questions about Creative Groups or want to try them out.